There’s strong geological and biblical support for the idea of Pangea, an original supercontinent. It appears this land mass rapidly broke apart during the global Flood by the process of catastrophic plate tectonics (CPT). The movement of the plates also formed the ocean basins and mountains in today’s world. The same phrase, “ for in his days the earth was divided ,” also appears in the repetition of this genealogical entry in 1 Chronicles 1:19 . Many find these genealogical lists very boring to read. So they skip over the details and often miss this phrase. However, there are some Christians who get excited about this phrase, and latch on to it, suggesting that maybe this is where continental drift, which secular scientists have proposed, fits into the Bible! It seems odd that this little “nugget” should appear in this genealogy of Noah’s three sons and their descendants after the Flood. But, does this phrase, “ for in his days the earth was divided ,” suggest that continents drifted apart in the days of Peleg as a result of God dividing and separating the continents? Figure 1. The Mid-Atlantic Ridge is strong support for the concept of plate movement. In today’s secular society, people have been taught as fact that the continents were once joined together in a supercontinent that spilt apart and then the resultant continents drifted over millions of years into their present positions. One primary piece of conclusive evidence usually presented to support this idea is the jigsaw-puzzle fit of Europe and Africa matching closely with North and South America, respectively. If the North and South Atlantic Ocean basins are closed, these continents fit together at approximately the Mid-Atlantic Ridge, a range of mountains on the ocean floor centrally located in the Atlantic Ocean basins (figure 1). It was this reconstruction that led to the idea of the earlier supercontinent called Pangea. The secular concept for this continental drift, now known as plate tectonics, goes further and suggests that there were supercontinents even earlier than Pangea, including Pannotia, and before that Rodinia, encompassing the earth’s proposed multi-billion year geologic history. Creation scientists and Flood geologists do not deny that these continents may have been connected to one another in the past as a single supercontinent in light of Genesis 1:9 . Actually, it was a Christian geologist named Antonio Snider in 1859 who was the first person to publicly comment on this jigsaw puzzle fit of all the continents, except that he believed the spreading apart and separation of the continents occurred catastrophically during the Genesis Flood. Creation scientists believe, along with their secular colleagues, that there is good observational evidence that is consistent with an original supercontinent in the past that was split apart, and that today’s continents moved to their present positions on the earth’s surface. However, the main difference is the timing! Whereas our secular colleagues believe these processes were slow and gradual over millions of years, creation scientists insist it all took place by catastrophic means, involving continental sprint rather than continental drift. However, many Christians who see the specific mention of the earth being divided in the days of Peleg, as quoted from Genesis 10:25 , appeal to this particular time for the biblical explanation for continental shifting. What Happened in the Days of Peleg? A careful search of the context of Genesis 10:25 clearly reveals that the division of the earth refers to the dividing up of the post-Flood people on the basis of languages and families, and moving them into different geographical locations. In fact, all of Genesis 10 is dedicated to dividing up Noah’s family into its three major divisions based on Noah’s three sons and their families, and then to further list the sub-family groups. “ . . . separated into their land . . . ” ( Genesis 10:5 ). “ . . . the families of the Canaanites were dispersed ” ( Genesis 10:18 ). “ . . . according to their families, according to their languages, in their lands and in their nations ” ( Genesis 10:20 ). These were the families of the sons of Noah, according to their generations, in their nations; and from these the nations were divided on the earth after the Flood ( Genesis 10:32 ). The chronological sequence of events on what happened at the Tower of Babel is given in Genesis 11 , where we are told in verse 8 that “ the Lord scattered them abroad from there over the face of all the earth. . . . ” But it’s actually in Genesis 10 where we are told about the different groups of people who were divided up into their families with different languages as a result of the Tower of Babel judgement. It is appropriate to compare Scripture with Scripture in the context it is written. There are four verses listed above in chapter 10 (verses 5, 18, 20, and 32) which explain the statement (in verse 25) that “ in his days the earth was divided ,” as the division of family groupings according to the languages God gave them into different lands across the face of the earth. Verse 25 was not referring to an actual physical division of the earth from one supercontinent into today’s many continents. Let’s stop and consider for a moment what would be the effect of the break-up of a supercontinent followed by the sprinting of the new continents into their present positions. In late 2004, there was an earthquake in the eastern Indian Ocean, resulting in movements of up to 15 or more feet along faults. The energy of the earthquake was transmitted through the water above, producing an enormous tsunami that devastated coastlines all around the Indian Ocean basin, killing more than 220,000 people. And even a few feet of movement on the San Andreas Fault in Southern California causes the ground to shake for many miles, often resulting in the collapse of freeways and other structures. 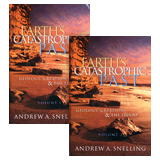 If the continents did indeed split apart in the days of Peleg, moving thousands of miles into their current positions in a catastrophic manner, the resulting devastation would have utterly destroyed the face of the earth and everything living on it. The ocean waters would have flooded over the continents in huge tsunamis, creating a second worldwide flood event! In Genesis chapters 10 and 11, we see no written description of such an event. To the contrary, at the end of the Flood in Noah’s day God made specific statements that He would never allow another worldwide Flood to ravage the earth’s surface and its inhabitants ( Genesis 8:21–22; Genesis 9:11 ). God specifically stated that He had set the boundaries around the land beyond which the waters would never again flood the earth ( Psalm 104:8–9 ). Of course, in order to shore up their belief that Genesis 10:25 is a reference to continental break-up during the days of Peleg, some may respond that God somehow miraculously held back the ocean waters to keep another flood from happening while this land division occurred. However, there is absolutely no indication in Scripture, not even a hint, that this was the case. Quite clearly, it is far better to err on the side of caution with regard to these Scriptures. This is particularly necessary when the context of Genesis chapter 10 has four other verses that confirm the meaning of verse 25 as referring to the division of people according to their languages into lands of their own across the face of the earth. Furthermore, this is in keeping with God’s command to Noah and his family after the Flood to be fruitful and multiply, and to fill the earth ( Genesis 9:1 ). And the waters receded continually from the earth. At the end of the hundred and fifty days the waters decreased. Then the ark rested in the seventh month, the seventeenth day of the month, on the mountains of Ararat. Why is this so significant? The mountains of Ararat should not be confused merely with the post-Flood volcano in Turkey called Mt. Ararat. As far as we can tell, the biblical reference to “ the mountains of Ararat ” speaks of mountains located in the region of eastern Turkey and eastward toward the Caspian Sea. The buckling of the rock layers within these mountains indicate that they were formed by continental collisions. Thus, if a supercontinent such as Pangea broke apart in the days of Peleg to arrive at their present positions, then these mountains of Ararat would only have formed in the days of Peleg. Thus, they would not have existed on day 150 of the Flood for the ark to run aground on them! 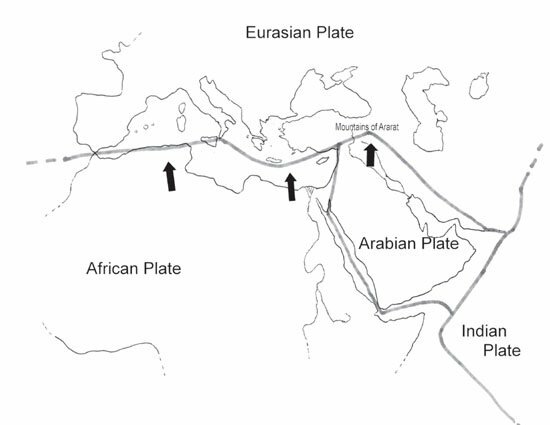 The mountains of Ararat appear to have been caused by the collision of the Eurasian Plate with the Arabian and African Plates, perhaps influenced by the concurrent collision of the Indian Plate with the Eurasian Plate (figure 2). Thus, it would seem that most of the continental shifting between Europe, Asia, Africa, Arabia, and India most likely would have largely been completed by day 150 of the Genesis Flood. Figure 2: Plate movement resulted in the formation of the Mountains of Ararat. Naturally, there still could have been comparatively minor adjustments after this point in the Flood, as the mountains of Ararat could still have been rising as further mountain building occurred after the ark ran aground. Again, there appear to be no hints in the biblical narrative of the Flood in Genesis 6–9 that there was any major continental shifting across the earth’s surface after day 150, at least in the region of the mountains of Ararat. It’s possible, however, that there still could have been some minor continental movement on the other side of the globe, with respect to North and South America, Australia, Antarctica, etc., and so this can’t be ruled out entirely. However, according to Genesis 8:2 , the fountains or springs of the great deep were stopped, and the windows of heaven were closed, on day 150, implying that the Flood waters possibly had reached their zenith at that point. Furthermore, if the springs were associated with the rifting of the earth’s crust and the seafloor spreading, and subduction and mantle convection that had moved the continental plates apart catastrophically, then the closure of these springs or fountains would seem to imply that the processes allowing for major movement of the continents would have stopped at this point, or at the very least, began to start decelerating, and eventually reach their present snail’s pace. All the primary geologic processes responsible for forcing the catastrophic continental movements during the Flood appear to have likewise begun to rapidly decelerate on and after day 150. 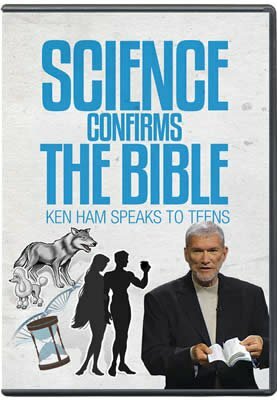 Also, Genesis 8:3 indicates that the Flood waters began to steadily decrease and therefore recede from this time point onward, which would seem to indicate that the Flood waters were now subject to new land surfaces and topography rising and valleys sinking as a result of vertical earth movements. This is in stark contrast to the large horizontal movement and associated mountain-building that shifted the continents apart in the first portion of the Flood year. There are numerous evidences that support the contention that the pre-Flood supercontinent split and the resultant continents shifted apart catastrophically during the Flood. Several of these are highlighted below. Huge areas consisting of thick volcanic rock layers stacked on top of one another are found in a number of places on today’s continents. Even secular geologists recognize these as catastrophic outpourings of huge volumes of lavas, so they call them flood basalts.2 The two largest examples are the Siberian Traps and the Deccan Traps of India. A smaller example is the Columbia River Basalt of the U.S. Pacific Northwest. Flood basalts are found on every continent, usually with fossil-bearing sedimentary layers beneath them, and further fossil-bearing sedimentary layers above them, indicating they are also the result of catastrophic volcanic eruptions during the Genesis Flood. The only way huge volumes of basalt lavas could be supplied for such catastrophic eruptions on such a grand scale was via huge mantle upwellings, called plumes. These plumes likely formed as a result of mantle-wide convection during catastrophic continental break-up and shifting. Since these flood basalts had to be produced during the Genesis Flood, then the rapid continental sprint and associated mantle processes also had to have occurred during the Flood. In the post-Flood sediments of Africa (including some volcanic layers), we find fossilized remains of apes, and, by and large, in sediment layers on top of them are found fossilized human remains and other evidences of human occupation. This fossil sequence on the African continent is thus trumpeted by evolutionists as evidence of apes and then humans having progressively “evolved” from a common ancestor. When Genesis 10:25 is read within the context of the whole chapter, the four other verses (5, 18, 20, and 32) speaking of the division clearly emphasize that this was a linguistic and family division of all post-Flood people into different lands (geographical locations). Had the division of continents occurred during the days of Peleg, then the associated catastrophism would have resulted in another worldwide Flood, in violation of God’s specific promise to Noah. Had the division of continents occurred during the days of Peleg, then the ark (with Peleg’s ancestors) would have had no place to land, as the mountains of Ararat produced by continental collisions would not have yet existed. There is tremendous fossil and geologic evidence for continental division having occurred only during the Flood. We, therefore, gently and lovingly encourage our brothers and sisters in Christ to refrain from claiming the division of continents occurred during the days of Peleg. The phrase “ for in his days the earth was divided ” in Genesis 10:25 needs to be kept and read within its context of Genesis 10 to give it its correct meaning. On the other hand, we also want to encourage people to realize that the Flood is the only major catastrophic event and the only logical mechanism for splitting apart the continents. Answer: There are other uses of this word, as Hebrew lexicons readily point out, meaning particular nations or inhabitants. For those not fluent in Hebrew, one needs to consult reputable Hebrew lexicons such as The Brown-Driver-Briggs Hebrew and English Lexicon (BDB) or The Hebrew and Aramaic Lexicon of the Old Testament by Koehler and Baumgartner (KB) to see how each Hebrew word, in its context, should be used. Naturally, these do not hit every instance but representative instances (keep in mind erets is used well over 2,000 times in the Old Testament). BDB uses as one of its representative examples that Genesis 11:1 is in reference to inhabitants of earth.5 However, the two brought up in Genesis 10 are not mentioned. So to exclude this definition may not be wise. And considering that BDB used erets specifically in Genesis 11:1 to refer to people confirms the point. According to leading Hebrew lexicons that utilize the context, these would be referring to the people being divided by language. Also, keep in mind that if one wants to argue for erets to mean “continent(s),” this is not even listed as a definition among the lexicons. Genesis 10:5 — From these the coastland peoples of the Gentiles were separated into their lands, everyone according to his language, according to their families, into their nations (emphasis added). Genesis 10:20 — These were the sons of Ham, according to their families, according to their languages, in their lands and in their nations (emphasis added). Genesis 10:31 — These were the sons of Shem, according to their families, according to their languages, in their lands, according to their nations (emphasis added). Answer: The name of Peleg [Strong’s Concordance #06389] in verse 25 is a variant of [#06388] peleg, which in turn is a derivation of [#06385] palag. This same root word for Peleg’s name is also used in Genesis 10:25 . It makes sense why this was used in direct reference to Peleg’s name. But this is still different from verse 32 where [#06504] parad is used. However, they each appear in the same context. In fact, parad is also the Hebrew word used in Genesis 10:5 where it states: “ From these the coastland peoples of the Gentiles were separated [parad] into their lands, everyone according to his language, according to their families, into their nations. ” Later Mosaic writings in Deuteronomy 32:8 also use parad in reference to the split of nations. This Hebrew word palag is used only three times in Scripture outside of Genesis 10. In 1 Chronicles 1:19 it repeats Genesis 10:25 . In one case it refers to a splitting of a water channel when it overflows in poetic Job 38:25 . The other usage is in Psalm 55:9 where it refers to splitting of languages. David was speaking of his enemies and was asking the Lord to judge them with the splitting of their tongues. Obviously, David was conjuring thoughts of the Tower of Babel and tongue-shifting there. Peleg’s name was a direct derivation of palag, and considering the context of Genesis 10 , it makes sense this Hebrew name was indeed referring to the linguistic division. So there would be no reason to distance from this plain interpretation. Previous Chapter Did Life Come from Outer Space? Next Chapter Vestigial Organs—Evidence for Evolution? J.F. Dewey and J.M. 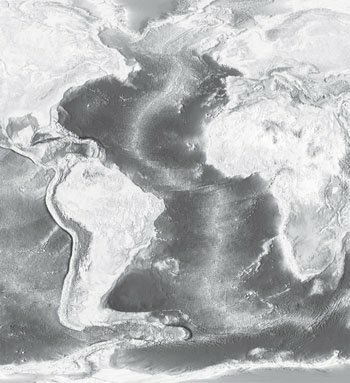 Bird, “Mountain Belts and the New Global Tectonics,” Journal of Geophysical Research 75 no. 14 (1970): 2625–2647; R.S. Dietz, “Geosynclines, Mountains and Continent-building,” Scientific American 226 no. 3, as reproduced in Continents Adrift and Continents Aground (San Francisco, CA: W.H. Freeman and Company, 1976), p. 103–111. 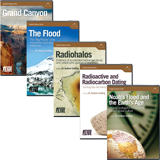 S.A. Austin et al., “Catastrophic Plate Tectonics: A Global Flood Model of Earth History,” in Proceedings of the Third International Conference on Creationism, R.E. Walsh, ed. (Pittsburgh, PA: Creation Science Fellowship, 1994), p. 609–621. K.P. 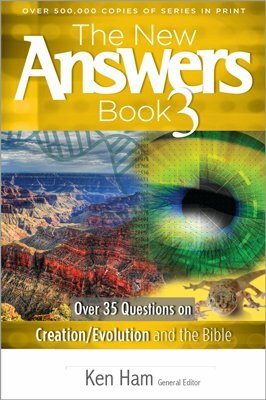 Wise, “Lucy Was Buried First: Babel Helps Explain the Sequence of Ape and Human Fossils,” Answers, April–June 2008, p. 66–68. These are actual comments made to Answers in Genesis regarding the issue of an alleged continental split during the days of Peleg. Brown-Driver-Briggs Hebrew and English Lexicon (Peabody, MA: Hendrickson Publishers, 2005), p. 76. L. Koehler and W. Baumgartner, Hebrew and Aramaic Lexicon of the Old Testament, Volume 1 (Boston, MA: Brill Publishers, 2001), p. 90–91. The Works of Josephus, Complete and Unabridged, trans. by William Whiston (Peabody, MA: Hendrickson Publishers, 1988), p. 37.